Calvin Pickard has played in a grand total of 86 NHL games since being drafted by the Colorado Avalanche in the second-round of the 2010 NHL Entry Draft. Of those 86 games, 74 were starts. Pickard has amassed a record of 28-44-6, with a 2.77 GAA and .914 SV%, along with 3 shutouts. How, then, with such a small body of NHL work and an admittedly dismal record, is Calvin Pickard an elite goalie? 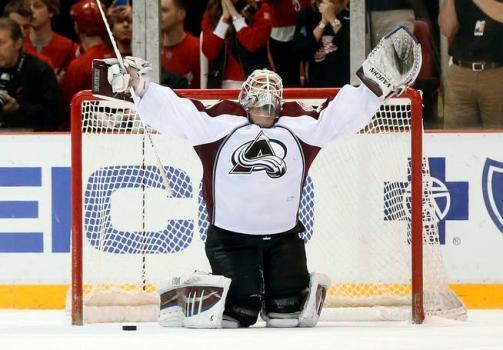 Calvin Pickard has played every game of his career with the Colorado Avalanche. He played his first game in the 2014-15 season, in which the Avalanche were a very poor team. Since then, he has served as backup/interim starter to Semyon Varlamov, getting most of his games under his belt while Varlamov was on injured reserve, or when he was pulled and Pickard had to salvage the game. It is worth noting, also, that Pickard appeared in net for Team Canada in the World Championships, starting 2 games for the gold-medal-winning team in 2016, and starting 7 out of 10 games for Canada this past Spring en route to a silver medal. After the 2016-17 season, Pickard was left unprotected in the 2017 NHL Expansion Draft for Vegas’s taking, and lo and behold, was taken. He immediately got involved in the Vegas community, having fans design his mask and appearing in a number of preseason games for the Golden Knights. Then, just this past week, he was traded to the Toronto Maple Leafs for forward Tobias Lindberg and a 2018 sixth-round pick. Pickard reported directly to Toronto’s AHL affiliate Toronto Marlies, and joins his new goalie partners Kasimir Kaskisuo and Garrett Sparks. Thus far, Sparks is the only one out of those three to have played in a game this season for the Marlies. 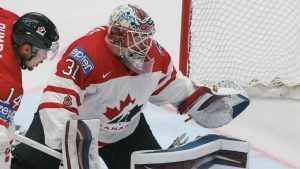 There is not much to show for in his NHL career statistic-wise, but Pickard has proved himself on the world stage in the World Championships, medaling both times he was on the team in a tournament harder and more skilled than most would think. Also, he has a sub-2.80 GAA and a SV% over .910, while winning near 40% of his games in an Avalanche sweater— which, for the team that the Avs were while he was there, is actually pretty remarkable. I remember watching Calvin Pickard in his first start with Colorado— I enjoyed watching him, and thought he was a fundamentally sound goalie who could also pull off some athletic moves. I also recall on several accounts him posting 40+ save performances in losses and allowing only one or two goals. Do not be mistaken, Pickard is a very talented goalie. He has just been dealt a poor hand to start his career.